The Primary Division includes Grades 1 - 3. These are important years in the lives of our boys, setting the stage for success in the years to follow. In Grades 1-3, the focus is on fluency in reading and writing as well as foundational mathematics. 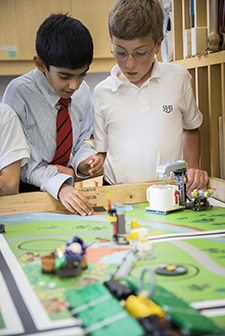 As part of their essential skills development, boys learn to inquire, analyze, build, relate, create and problem solve. Classes remain small, allowing our teachers to provide the individual attention that boys of this age need. During these years, our boys deepen their knowledge through increased exposure to specialized instruction in French, science, music, art, drama and technology. Our guided reading program provides each boy with direct support and guidance from a reading teacher as he reads and processes texts at increasingly challenging levels of difficulty. Math instruction focuses on an in-depth understanding of essential math, with a special emphasis on problem solving. Our boys enjoy physical education every day. Their independence is furthered through class trips based on topics that are current, relevant and connected to their classroom learning. One of these trips is an overnight stay, preparing them for extended trips they will go on in future years.